Some doorposts made from the wood. Armchair members do get involved! weeks before the builders were due to arrive). arranged with a friend in the University's maintenance department (who'd visited the railway on the diner service) to "sort the problem". 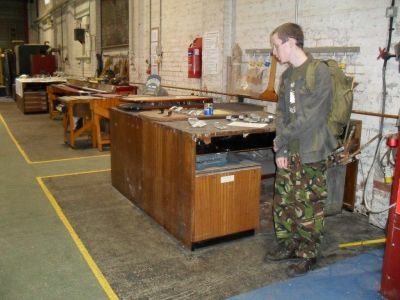 The benches were removed the next week with Hugh & Richard, and they then made their way to Kidderminster for installation in the North Star works. Then as the piles of dismantled benches began to grow in the car park at work, there began a weekly, sometimes almost daily collection of wood by members of the LNER Coach Fund. Both Tom Root's & Richard's cars were to be seen well loaded. 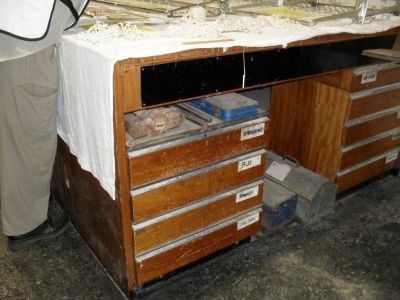 As the deadline to clear the labs approached, it became obvious that I was not going to be able to extract all of the wood during just my lunch breaks so, my boss formally "told me to remove the benches". I then had two weeks of solid bench dismantling, although demolition is probably a more accurate description, as some of it was none too subtle (dropping over a hundred weight of Iroko & beech to spring the joints) certainly woke a few people up. My son (an SVR junior member) was also involved in this, as his work experience rather fortuitously coincided! Several colleagues also "dropped in" to see what was happening. It must have been the bench nearly falling in to their offices below, and they were awarded either a screwdriver or crow bar, Thanks Lad's! first benches' removal and subsequent re-use on the LNER Fund's website paid dividends, as the contractor agreed to place ALL of the hardwood removed in the car park prior to it's being "skipped". 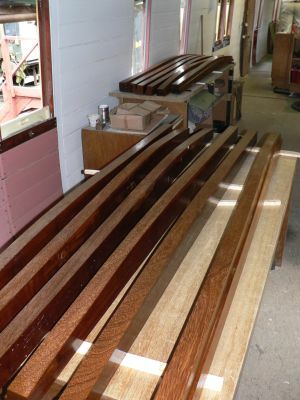 Several large pieces of Iroko up to 12' long,18" wide by 2" thick plus several "heavyweight" benches 2' wide, 8' long by 3" thick also appeared ready for collection. So ended the 2006 season of timber reclamation. load our "treasure" ready for its delivery to Kidderminster. Having read in the SVR magazine the various articles on the restorations of several coaches, every time that "Iroko" is mentioned, I have a shrewd idea of where it came from. So I'll ask the question – can an "armchair" member help in restoring the railway's stock? I believe the answer is "Yes you can". Even through the last few months when the railway has been fragmented, I've still managed to acquire more timber to keep stocks up ready for the next restoration, I may even become an active member. together with a reciprocal arrangement with the builders. Just look at the website to see the results, the pictures of the wood pile inside the building and of the loading of the timber at my workplace now feature on the website. Having helped to move & load the timber with Richard & Mike, we estimated that there was about 1.5 – 2 tons of wood on this latest episode (from the way the trailer springs were bent). If you want to know what this is worth to the Fund, then I suggest you look up the price of Iroko from your local timber merchant for four of the 100 x 150 mm pieces which were 5 metres long. I found a price on the web for a 4 metre length (the longest they do) at £117 each, just look at the website pictures of Richard Gunning for the number of pieces there were. So to answer the question I posed in the original article back in 2008, do “Armchair” members help? Just look at what one member has achieved! I know from reading the SVRA forum website other “Armchair” members do their bit too.